The gypsy moth is a well known pest in Connecticut – accidentally introduced to the United States in 1869 in Massachusetts.. It is best known for the incredible damage it caused to trees around the state in the 1980’s. The larvae, which are large dark colored caterpillars with red and blue dots on their backs, eat the foliage off of trees and become a serious problem if given the opportunity. The reason we have not seen or heard of the gypsy moth since the 1980’s is because it has a natural enemy – a fungal disease that attacks the moths and destroys entire populations. 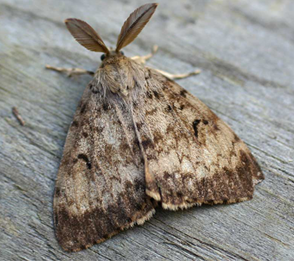 This fungal disease cannot survive when there is a dry spring – allowing the gypsy moth to flourish. Spring of 2015 was very dry and there were many gypsy moth sightings during the summer. Due to this, we are expected to see large populations of the gypsy moth in 2016. There is only one generation of the gypsy moth each year. Caterpillars hatch from the buff-colored egg masses in late April or early May. An egg mass may contain 100 to more than 1000 eggs laid in several layers. A few days after hatching, the ¼ inch long caterpillars will ascend the tree and begin to feed on new leaves. The caterpillars generally complete their feeding sometime around the end of June and the first of July and seek a protected place to pupate and transform into an adult moth in about 10 to 14 days. Male moths are brown and can fly. The female moths are white and cannot fly. The female moth will lay a single egg mass and die. These eggs will pass through the winter and larvae will hatch the following late April or early May. While there are a number of insecticides labeled for the control of gypsy moth on ornamental trees and shrubs, they need to be applied early in the season and thorough coverage of the treated trees by a licensed arborist is necessary for good control. Contact Might Oak Tree & Lawn Care today to learn more about your gypsy moth treatment options.